How To Remove Error "outlook.pst cannot be found"
PST – Personal Table Storage is a desktop emailing where all the data like messages, mails, event calendar etc can be copied or saved. Outlook PST cannot be found is an error that occurs on the screen when there is damage or alterations to the (.pst) file. In any case the data in the file that is copied or stored will be lost. This upset can be very hectic at times if or when someone has very important information and counting on it. This error will prevent users to launch .pst files which will keep them from data they got copied in it. It might prevent them to even launch the outlook completely. Even though the error is quite known to a lot of people, many people may still don’t understand the meaning and the effect it got on their files. Although nothing much can be done to keep an eye on the causes leading to this error but still there are a few of them which are the most probable ones. First reason may be that the .pst file is unavailable on the current network server. The second reason is corruption of .pst file. And third reason is that PST file is available on the network drive but not supported by LAN or WAN connection to trigger it. 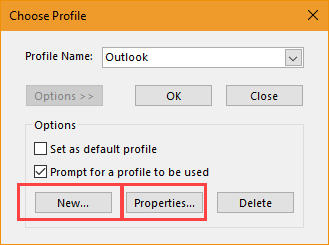 One of the solution to remove the above error is by creating the new Outlook PST file.If you don’t have important data residing in the PST file you can chose this method. Just delete the PST file > Close Outlook and Relaunch Outlook. Second method is to use scanpst.exe application which is also known as Inbox Repair Tool and available for free with Office installation. The correct method to use this tool and where to look for this application is mentioned in the post Repair PST File with Inbox Repair Tool This method is not able to repair severe corruption issues related to PST file, It only repairs small header corruption issues. The error can cause loss of all data which directly or indirectly unable the users to open the data files or in some cases completely prevent to launch even Outlook. Although these causes may not be avoided there are ways to recover the data.